Last month the National Academy of Science published research by Anne Case and Nobel Prize winner Angus Deaton of Princeton University. Their work shows a remarkable increase in death and morbidity concentrated among white middle-aged Americans. The scale of this change (500,000 new deaths) is comparable to the impact of the AIDS crisis which claimed 650,000 Americans’ lives over a longer period. 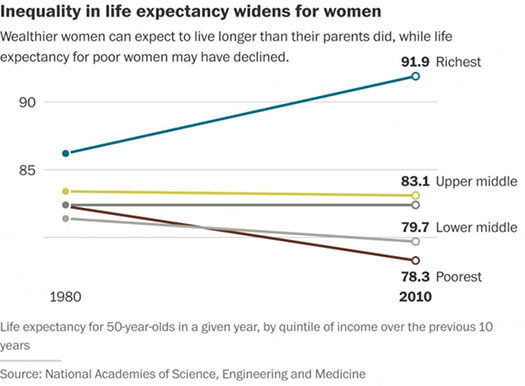 This is another sign of economic stress and its influence on American health, which I highlighted last month under the headline “The Poor Die Sooner Now.” It draws on different NAS research showing that while lifespan in the US is increasing in aggregate, these gains are concentrated to the richest 20% of the population, with no benefit to the remaining 80% majority of the population. This new research adds the factor of age and race to the picture, and it adds details about dramatic health deterioration among whites in mid-life. 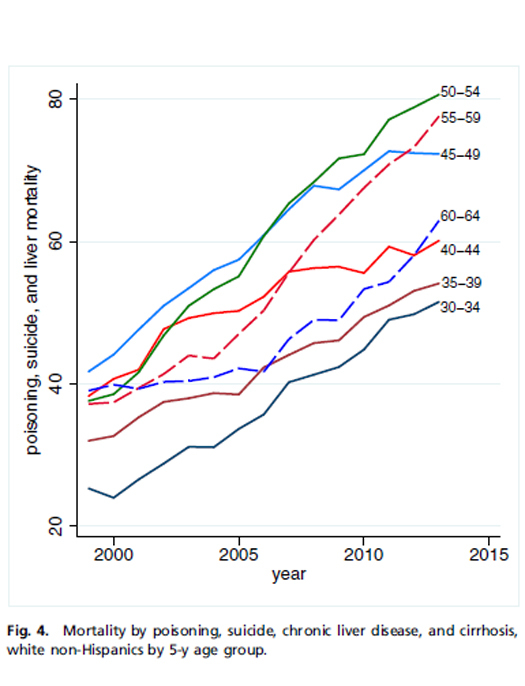 Since 1970 a combination of behavioral change and medical treatment had reduced the death rate of middle aged Americans, those aged 45 – 54 by 44%. 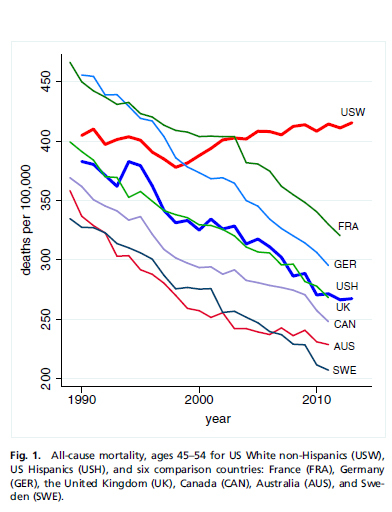 The trend was matched by other rich other rich countries, which like America saw an overall pattern in declining death rates across ages, including even the oldest age groups. But since 1999, white non-Hispanic men and women in this middle-aged group have taken a different track showing increased mortality. As I look at this chart, I can’t help but feel something alien about referring to USW – white Americans – as being featured as an at-risk population. But that is the conclusion of this research, and like other writing I’ve done on inequality, it connects stories we here in the news such as opioid addiction and skyrocketing disability rates. If the white mortality rate for ages 45 – 54 had held at their 1998 value, 96,000 deaths would have been avoided from 1999 to 2013. If the death rate had continued to decline at its previous 1979 – 1998 rate, half a million deaths would have been avoided in the period 1999 – 2013, comparable to the lives lost in the US AIDS epidemic through mid-2015 which took the lives of 650,000 Americans. 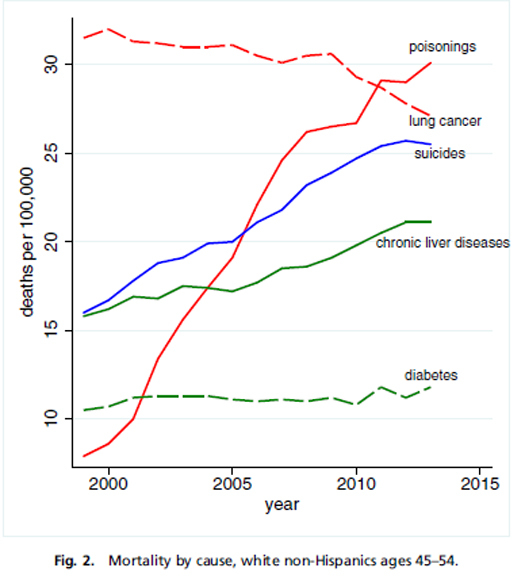 While lung cancer and diabetes (connected to gluttony, inactivity and smoking) declined, chronic liver disease, suicides, and most notably a four-fold increase in poisonings more than off-set those gains. My own synthesis of this pattern is that middle aged white Americans are self-medicating in response to stress – apparently through alcohol as evidenced by liver disease, poisonings which track with a larger pattern off opioid addiction and suicide which can be linked in stress related depression. The researchers show age groups in five year band, and that the concentration of this effect is greatest among 50 – 54 year olds. Participants described their own health as deteriorating, reporting chronic pain, emotional distress, difficulties with activities of daily life and greater alcohol use. Such reports correlate with recent large increases in Americans on disability, and CDC reports that the American deaths from drinking (30,000) are now greater than opioid abuse (28,000). This trend raises concerns that those currently in mid-life may age into Medicare in worse health, and so require resources greater than the current elderly cohort. Longevity may be one of the most basic societal signals of being on the right or wrong track, of making progress or getting entangled. I believe this shows ways economic stress and the frustration of reduced opportunities become a physical restraint on well-being. Culture, economics and health influence one another, and from this base change of all types is possible. I’d love to hear where you’d start. 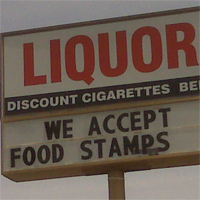 1 Response to "Economic stress in the US may already have an epidemic health impact"